If you have heel pain, you’ll need a foot doctor to help you treat the problem so you can get on with the good parts of life. The first step of treatment is to determine what’s wrong. Your foot doctor will ask questions about your pain such as when it started and when it happens most often. They will also do an examination to determine the cause and the appropriate treatment. This may include comparing one foot or leg to the other and manipulating your feet, ankles, and legs to determine where and how the pain originates. The most common causes of foot pain are plantar fasciitis and Achilles tendonitis. For heel pain caused by one of these, conservative therapy is often tried first. This could include rest, ice, anti-inflammatory medications, stretching, and well-fitting shoes. Arch supports and custom orthotics are often helpful as well. If none of that works, your foot doctor may recommend a cortisone injection, or for those who don’t like shots, it comes in pill form too! 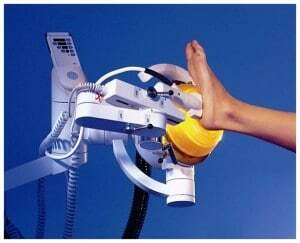 Extracorporeal shockwave therapy works for chronic nonhealing heel pain and promotes healing of the inflamed tissue. This is always recommended before we even consider surgery. If you have nerve entrapment causing heel pain, this may be treated with many of the same conservative remedies as plantar fasciitis. Occasionally, a nerve entrapment may need to be treated with surgery to free the nerve and stop the foot pain. Tarsal Tunnel is one such type of nerve entrapment type syndrome. Bracing like you do for the related condition carpal tunnel often helps and those are available at your podiatrists. Arthritis and gout can also cause foot pain; the usual treatment for these includes medications such as anti-inflammatories and rest. If gout is causing your foot or heel pain, you may be asked to experiment with leaving certain foods out of your diet to reduce the attacks of gout. Sciatica and nerve compression might also cause heel or foot pain, and for this your foot doctor might recommend physical therapy, medication, or an orthotic shoe insert or device. If this does not help or if the nerve in question is not in your foot or leg, you may be referred to a different specialist for further treatment. The foot doctors here at Beaver Valley Foot Clinic based in Pittsburgh, PA, can inform you of the various options available for your particular foot pain and help you determine what you want to try first. You may also be advised about how to prevent further heel pain with appropriate levels of exercise, properly fitting footwear including the right socks, stretches, self-massage techniques, ESWT and information about when to stop and rest. Call now for general information or to schedule an appointment 878-313-FEET (3338)!